I like dishes that are quite flexible in their composition, then they can be done with minimal preparation, it is convenient. Let's start the week with bruschetta. And if you keep a vow of vegetarianism – freely take the chicken out of the compound. 1. First, finely cut all vegetables: zucchini (1 pc), celery (1 stem), chili pepper (1 pc), mushrooms (3-4 pcs) and sorrel or other greens for season and taste. 2. Mix them in a deep cup. Add chicken mince (50-70 g) or finely chopped chicken, a couple of spoons of olive oil and salt / pepper to taste. 3. Make a bowl with a foil, lay our vegetables out and cover them with foil. Bake for 20 minutes at 180 degrees. Here is a moment – if you want more fresh and crispy filling – bake exactly for 20 minutes, if you like the texture of vegetable caviar – keep the vegetables in the oven for 35-40 minutes. 4. While the vegetables are baking, it is time to cook the bread. Here are some subtleties. First and foremost – try to find Ciabatta. It is such an Italian bread, very porous inside (and the pores are very large) and at the same time quite hard. It fits best for bruschetta, more juice enters the pores and while frying the toasts are crispier. Cut the slices at 1 cm of thickness and fry in a dry frying pan for 3 minutes on each side. Of course, it will be more beautiful and tasty to make a grill on a frying pan. And to make the drawing more beautiful – cover the slices with a plate (so that she presses the toasts more evenly). You can sprinkle with olive oil. 5. Carefully lay finished stew out on toasts, evenly distribute the vegetables, do not make them too thick. 6. 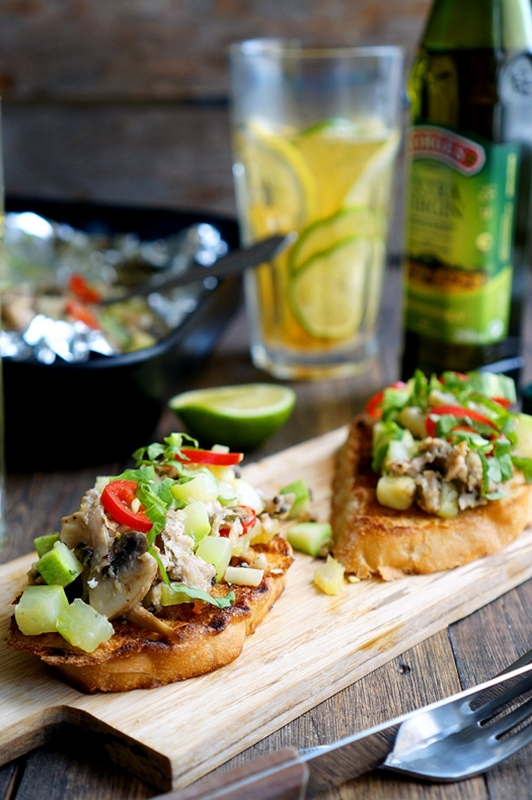 By the way, there are other bruschetta recipes in the blog, check out!